BCRF researcher Dr. Fatima Cardoso consults with a male breast cancer patient. In recognition of Men’s Health Week, BCRF is focusing on male breast cancer – a lesser-known subtype. Men’s Health Week–appropriately timed with Father’s Day– is internationally recognized as an occasion to focus on men’s health and wellness. While many organizations will focus on heart disease or prostate cancer during this week, BCRF wants all men to know that breast cancer is not just a disease that impacts women. That’s right, men can get breast cancer. In fact, an estimated 2,470 men in the U.S. will be diagnosed with breast cancer this year and nearly 500 will die from their disease. A rare and understudied disease that often goes undiagnosed. Male breast cancer is a rare disease, accounting for less than one percent of cancers in men and all breast cancer diagnoses. The most prevalent risk factors for male breast cancer are the inherited mutations in the BRCA2 gene. However, men without inherited genetic mutations can also get breast cancer and we still do not fully understand the causes. Most oncologists will rarely see and treat a man with breast cancer. Even when a man sees his primary care physician with unusual chest symptoms, neither the doctor nor the patient expects breast cancer and so it often goes undiagnosed until it is more advanced. The rarity and lack of surveillance of male breast cancer makes it a difficult disease to study. However, BCRF investigators are tackling this challenge with the International Male Breast Cancer Study (IMBCS). 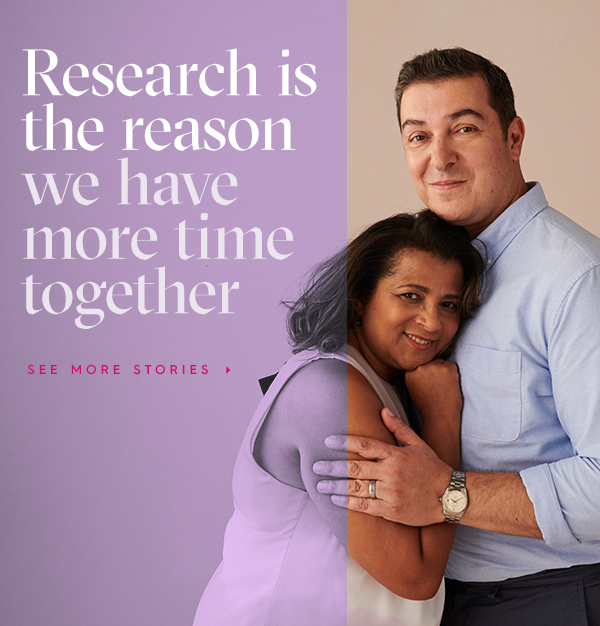 Led by BCRF investigators, Dr. Fatima Cardoso and Dr. Sharon Giordano, the IMBCS is the largest international study in male breast cancer ever conducted. What are we learning about breast cancer in men? In December 2017, IMBCS investigators reported that as in female breast cancer, most breast cancers in men require the hormone estrogen to grow. These cancers are called estrogen receptor (ER)–positive. Conversely, the HER2-positive type of breast cancer, which makes up about 25 percent of female breast cancers, occurs rarely in men. Triple negative breast cancer, a rare aggressive disease accounting for about 15 percent of female breast cancer, makes up less than one percent of male breast cancers. Despite most male breast cancers being driven by estrogen, the IMBCS researchers found that few male breast cancer patients receive the appropriate treatment for this form of the disease. They are continuing to analyze tumor tissue collected from more than 1,700 male breast cancer patients to help identify other drivers of the disease and potential drug targets. They are also launching an international prospective registry trial that will collect clinical data on all male breast cancer patients treated at the nine participating institutions over a period of 2 and a half years. The third part of the study will be a clinical trial to test new, targeted drugs in men with breast cancer. The future of treating male breast cancer was recently discussed by BCRF investigator Dr. Ben Park at the 2018 Male Breast Cancer Coalition Fest in New York. Dr. Park explained that to precisely treat the disease, it is important to know the mutations driving its growth and survival. We are already seeing the success of this approach in female breast cancers with targeted therapies against tumor promoting pathways, such as HER2 and CDK4/6. Similarly, Dr. Park envisions a future where all cancers are matched for the mutations in the tumor, making it less important whether that cancer is in the breast, the lung or colon or whether the patient is male or female. As an example, Dr. Park described the Patient Response to Immunotherapy Using Spliceosome Mutational Markers (PRISMM) trial at John’s Hopkins University. In the PRISMM Trial, Dr. Park and his colleagues will analyze the mutations in tumors of patients with advanced cancers and attempt to match the treatment with drugs targeted to the unique mutations in each patient’s tumor. These kinds of precision therapy clinical trials are changing how we test new treatments, with the goal of accelerating the right drug to the right patient at the right time. The Male Breast Cancer Coalition is a great resource for support and information that is run by a dedicated group of men with breast cancer and their families.